Many novice triathletes that don’t have a swimming background struggle to improve their swim times. Swimming is a very technical sport and as water is about 800 times denser than air, every small stroke error can result in more drag or less efficiency and will result in a slower swim pace. It’s very important that novice swimmers immediately focus on the right things as bad habits are very difficult to overcome. 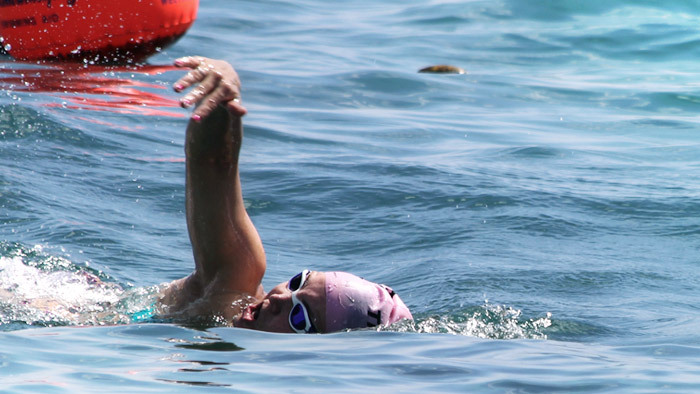 Here are five simple tips you can use to improve your form in the water. Holding your breath underwater is a common mistake that makes swimming harder. Doing so makes you feel tenser and, on top of that, the air in your lungs will add a lot of buoyancy at the chest, resulting in your legs sinking. Exhaling freely when your head is turned down into the water will release this tension and will make it more easy to inhale when you turn your head to breathe. A good breathing pattern should be the first point to work on for novice swimmers. A good breathing pattern will make you feel more relaxed in the water. Some swimmers are not aware that exhaling in the water is by far the most important part of the breathing pattern. It will be challenging to get your breathing under control, but it will definitely help you with further developing your swim style. You would be surprised how many stroke errors are caused by a poorly developed breathing technique. Ask a coach or a friend to look at, and if possible, take a video of your swimming. Seeing yourself swimming and understanding what you’re not doing right can be a huge help in addressing the most important areas for improvement. A lot of people think that a video analysis is only for elite swimmers, but this is a misunderstanding. It’s very important to tackle your biggest weaknesses as soon as possible, before they become a habit. The currently available technologies make it very easy to record your swim style. Fins are the perfect tools to develop your stroke. It will help you to get that extra propulsion in order to be able to focus on the right aspect of your swimming. A technique exercise or drill is only efficient if it’s done in the correct way. Fins will help you to put all your attention in your exercises. As a bonus, the fins will help increasing your ankle flexibility. To improve your technique the flexible, longer fins are prefered over the shorter fins.. Improving your swim technique is about changing habits. It will take some time before you will feel any improvements. Be patient and continue performing the exercises and understand that changing habits will feel unnatural at first. It will take several sessions before you’ll start feeling the changes becoming effective. You’ll need to be in the water to develop a good feel for the water. It is more productive to be in the pool three times a week for shorter sessions rather than twice a week for longer sessions. Make sure you have a plan before you jump into the pool. Plan what you’ll do in the session and avoid long continuous swims. A long continuous swim can be a valuable type of training for triathletes or open water swimmers but it will not help new swimmers improve their technique in the first place. If you’re still unsure about your progress, check out a local coach or join a squad to give you the small tips you need to bring your swim to the next level. Filip Rigole, a TrainingPeaks certified Level 1 coach, is owner of Endurancepeakcoaching in Zwevegem, Belgium. He's been active in triatlon for over 25 years both as an athlete and as a coach. He not only offers one-on-one coaching as well as trainingplans, but he also offers video analysis and correction session for swimmers.